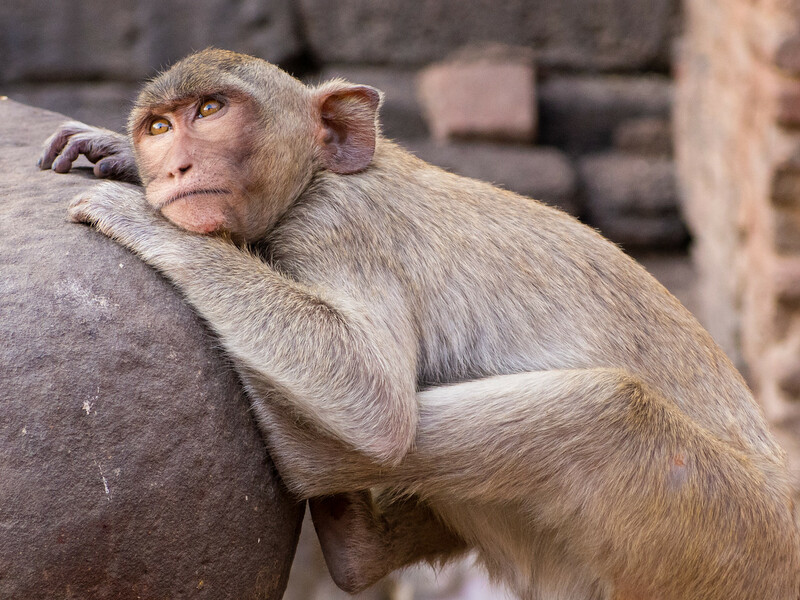 (Updated: July 2018) I had never heard of the Thailand Monkey Temple (Phra Prang Sam Yot) in Lopburi, Thailand until just before I visited and I didn’t really expect to find something so unusual in this otherwise seemingly ordinary Thai town. 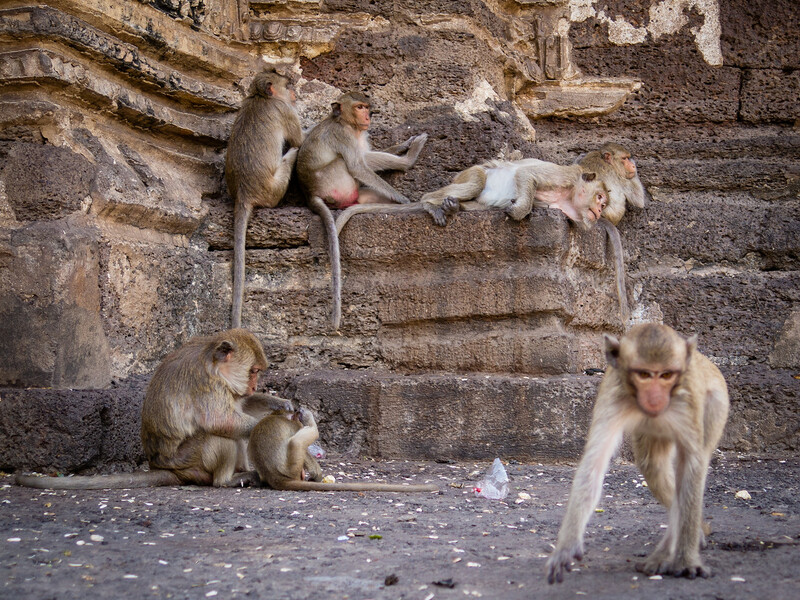 The temple itself is located right in the center of what apparently once was a thriving downtown area that is now largely abandoned and given over to monkeys (more accurately crab-eating macaques). Just finding a parking place was a challenge. 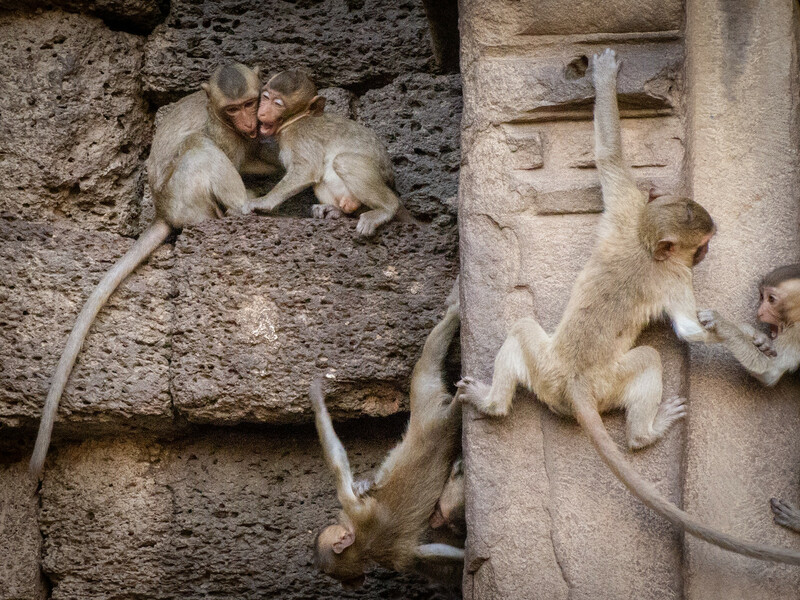 Not because of crowds, there aren’t any, but because of gangs of monkeys roaming the streets. From the outside, Phra Prang Sam Yot looks quite ordinary, but out of place, because you don’t see a lot of Khmer style temples in Thailand, but it is what is inside that truly makes the place unique. There are monkeys everywhere! Aggressive monkeys. Monkeys that want to climb on you and reach into your pockets. Monkeys that scramble between your legs and swing on your camera strap. They are cute and funny but at the same time, the numbers can be a little overwhelming. 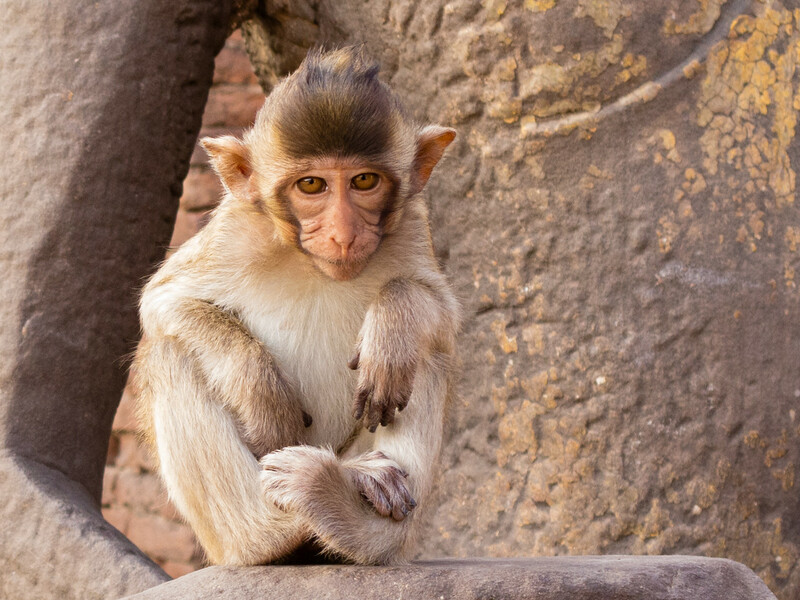 It is definitely worth visiting the Monkey Temple; even worth a special trip if it is the right season and you combine a mini-adventure with a visit to the sunflowers. Just beware. You will leave with monkey paw prints on your clothes and these little buggars would be happy to run off with anything you have that they might like to play with. We got away unscathed but the car wasn’t so lucky: There were paw prints everywhere and the rubberized antenna has some permanent chew marks. 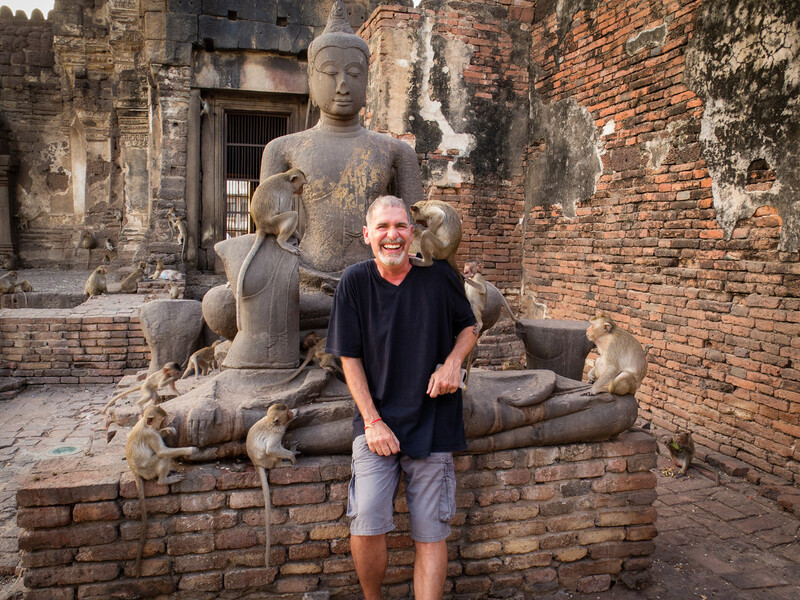 Lopburi is divided into New Town and Old Town. Phra Prang Sam Yot is located in the Old Town within walking distance of the train station. From the train station, there are regular trains to Bangkok and Ayuthaya. Although, taking the bus or minivan is usually quicker and more frequent, but they go to the bus station in the New Town and you may need to change buses at Saraburi. From the bus station, it’s either an hour’s walk or take a songthaew or motorbike taxi to the temple. Or do what we did, and drive yourself. 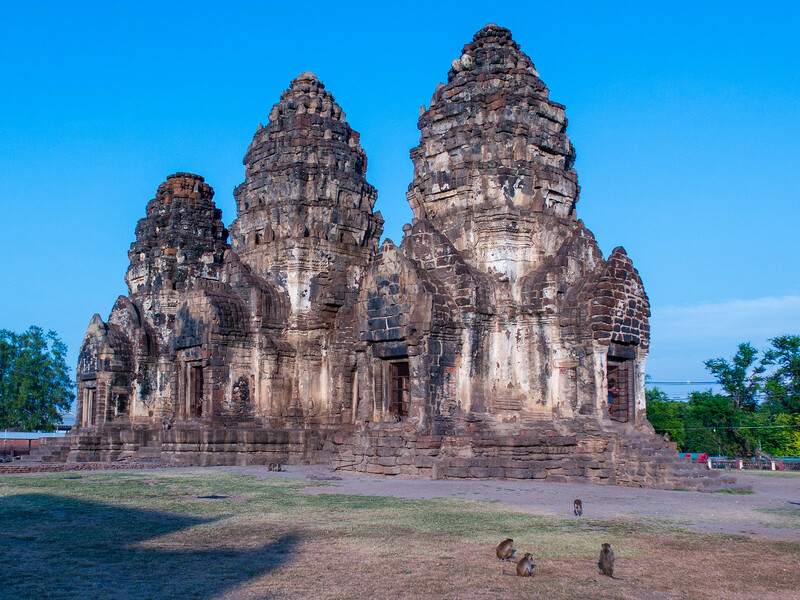 If you plan to stay in Lopburi for a night, the better accommodation and restaurants are located in the New Town. Many reasons to return! I am going to start seeing more in Eastern Thailand. So many surprises. Yes Julie, it was a little crazy! They were fun but a little aggressive. There was a “ranger” there to try and keep them in line but it was a bit of a losing proposition. Great photography! Looks like a hidden gem in this small town! It is, especially if you compine a visit with other trips. Not a whole lot to do there but it has its charms.